Five years ago, the 20-year-old credit-card program at United Bank in Atmore, Ala., was treading water. Back then, the program had added fewer than 10 new cardholder accounts over a six-month period. Recognizing the untapped potential of the credit-card program, United Bank’s executives were determined to fire up the program with new marketing and sales efforts. “We made a concentrated effort over a couple of quarters to focus on our credit-card portfolio,” recalls Greg Walker, senior vice president and director of marketing for the $550 million-asset community bank. As a first step, United Bank participated in “Win-Win,” a joint Visa-ICBA Bancard credit-card promotion. In addition to the cardholder and employee rewards offered through the program, the bank created its own in-house employee sales-incentive program, with individual and team prizes for cardholder referrals and credit-card accounts opened. Individually, staff members from across the bank were eligible for up to 20,000 ScoreCard rewards points based on their total number of referred cards. The individual competition gave staff from non-retail divisions and back-office operations the opportunity to participate and served to reinforce the credit-card program to all employees. In addition, leading branches competed for team rewards, such as “Jeans Friday” events allowing employees to dress casually at work. The combined efforts paid off: United Bank experienced an immediate increase in new credit-card accounts, with more than 85 cards referred in three months. More importantly, the program has seen long-term growth on several measures. Over the past four years, the bank’s credit-card accounts on file have risen 33 percent, the program’s credit line has risen 35 percent, and its portfolio balances grew by 37 percent. This summer, its total credit-card accounts grew by 10.3 percent and business accounts are up by an equally impressive 14.9 percent. 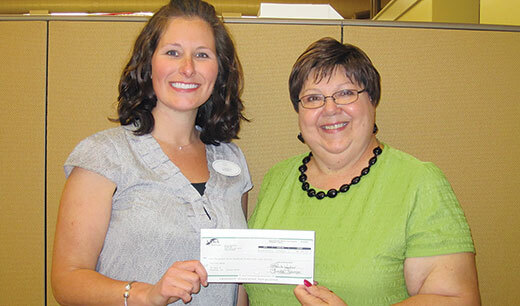 Cash Flow—United Bank’s Abby Wiggins and Lana Langford hold the bank’s latest annual interchange rebate check from ICBA Bancard for more than $23,000. Several factors have contributed to the success of United Bank’s renewed card sales and promotions. Foremost, Walker says the program itself is solid, offering low fixed rates for its Classic and Platinum personal Visa cards. The bank’s business card, which carries an attractive rate for companies of 5 percentage points above prime, has been particularly effective, achieving a 62 percent penetration of United Bank’s business customers. When you add the option of ScoreCard rewards points that don’t expire and the travel benefits and other support for the cards, the bank’s program is extremely popular. Another important success factor is the active support of United Bank’s president and CEO, Bob Jones. Jones regularly reviews the Automated Card Expert peer-comparison reports provided by ICBA Bancard. The reports help the bank better understand the program’s performance compared with comparable community bank credit-card programs, explains Julie Hanson, ICBA Bancard’s senior vice president, card and payment products. “Using these reports provides tremendous insights to help generate the kind of engagement and oversight you want with a credit-card program,” Hanson says. Along with sales and promotion efforts and an engaged CEO, United Bank has the benefit of a dedicated credit-card team to manage the program. Abby Wiggins, an assistant vice president and business solutions manager at the bank, works closely with Lana Langford, the bank’s credit-card specialist, to drive new business and support the bank’s existing client base. Wiggins, who takes the lead in structuring and monitoring United Bank’s program, enthusiastically recommends ICBA Bancard’s portfolio review as a means of improving a credit-card program. Based on a recent portfolio review, the bank has beefed up its fraud protection plan and is considering recommendations for increasing its consumer credit-card business. United Bank has been so pleased with the results of its first promotion and the continued growth of its credit-card program that the bank signed on for the 2016 Visa and ICBA Bancard’s Step Right Up promotion in August and September. As in 2012, the bank designed its own rewards in addition to the prizes provided through the promotion. There’s no doubt that United Bank’s bottom line benefits from the fee and interest income generated by its credit-card program. From a big-picture standpoint, however, the bank’s executives consider having a credit-card program to be essential in cementing customer relationships. The ICBA Bancard & TCM Bank, N.A.® program provides community banks affordable access to offer their own branded credit cards, debit cards, merchant processing and other digital payment products and services. ICBA Bancard unites the combined strength of ICBA’s members with the high-quality personal service characteristic of independent community banks. For community banks that prefer not to issue their own credit cards, ICBA Bancard can provide custom-branded credit cards, affinity cards, Visa Platinum cards or Visa Business cards through its subsidiary, TCM Bank, N.A. For more information, visit www.icbabancard.org, or call (800) 242-4770. Judith Sears is a writer in Colorado.